Projector ceiling mounts from Projector Ceiling Mounts Direct (PCMD) LLC. offers the consumer a quality ceiling mount at a fraction of the cost of others on the market. This projector ceiling mount can be rotated 360 degrees, and pitched and rolled in any direction. Max Tilt: +/- 80 degrees. The mounting plate is CNC machined for precise fitment and made from 6061-T6 aircraft grade aluminum. 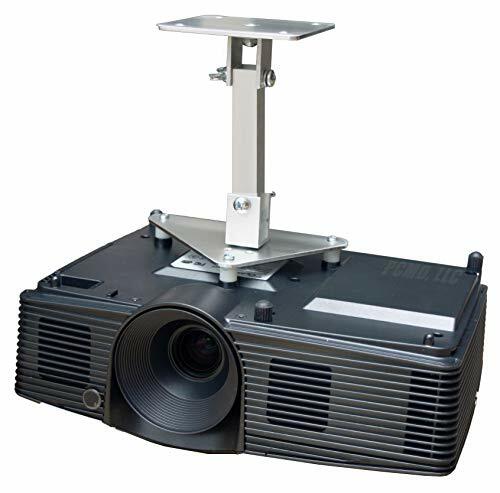 Unlike universal ceiling mounts, our projector ceiling mounts are specifically designed for your projector. This ensures proper hanging of the projector by utilizing minimal projector coverage as well as leaving adequate space for heat to escape. All the necessary hardware is included to install the ceiling mount onto your drywall ceiling or wooden beam and projector. Detailed instructions are also included for a quick and easy installation. This mount style sets the projector approximately 8 inches from the ceiling. Have a question? We respond to customer questions promptly and professionally. We strive to make your purchase the easiest it can be. Our mounts are proudly designed and manufactured in Ohio. We back up our mounts with a Lifetime Warranty and 100% Money Back Guarantee! Buy a new projector? Upgrade your mount for FREE! Our competitor charges their customers "$14.99 + S&H"
Orders will be shipped within 24 hours, Monday through Saturday. We believe you will be 100% satisfied with the form, fit, and function of your projector ceiling mount that we will extend a LIFETIME WARRANTY on all of our projector ceiling mount kits! Buyer pays return shipping and is not refundable. If you have any questions about this product by PCMD, LLC., contact us by completing and submitting the form below. If you are looking for a specif part number, please include it with your message.